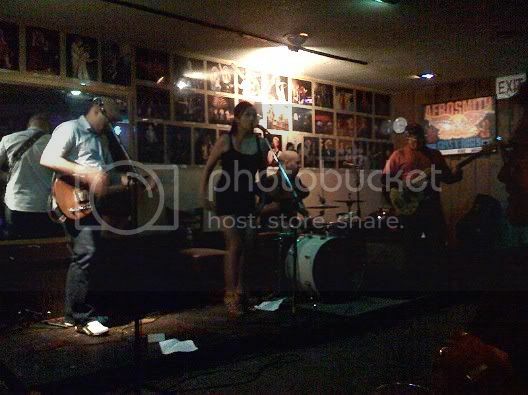 chuck and i and a few of our friends ventured out and saw the band "up all night" at the kibitz room last night. the chambers brothers also performed, which was pretty entertaining. the kibitz is actually the adjoining bar to the famous canter's diner. i just love the atmosphere there-by the looks of it, little has changed (other than the prices) since it was founded over a half century ago. many well known bands got their start there and it's had its share of celebrity visitors too (last night seth rogen was there, supposedly celebrating his birthday) the narrow stage makes for an intimate view, although it's not always the best venue to actually HEAR the bands, with the constant buzz of noisy bar goers filling the room. that said, i would still rank it high on my favorite L.A. spots to visit. I like the Kibitz Room all right, but the problem with Canter's is that the food is awful.